Box 1-3 sounded at 0120 hours arousing city firefighters from bed to a reported structure fire at 2123 Jefferson Street in the Uptown neighborhood. Responding from only a few blocks away, Wagon 3 arrived and laid in from Maclay and Jefferson Streets. Tower 2 arrived behind the Wagon, which positioned itself nicely in the tightly packed block, to set up the tower to the roof. Squad 8 caught Wagon 3's hydrant and Tower 1 staged at Jefferson and Forrest Streets. Chief 5 (Hartman) arrived and reported heavy to the rear requesting the balance of the 1st alarm bringing Wagon 4, Engine 6 (running in place of Tower 3), Rescue 69 (York Co), Chiefs 1 (Kunkle), 2 (Soulier), and 3 (Murray) to the scene. 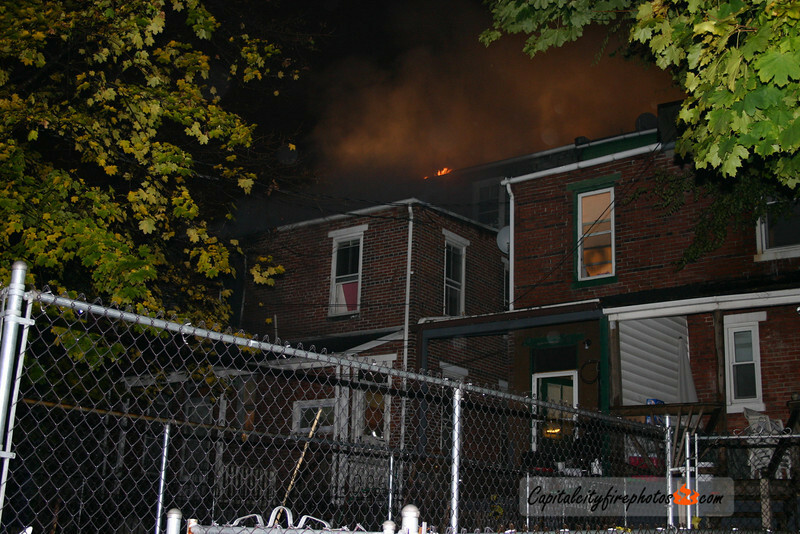 The fire involved an occupied, 3 story, brick, middle of the row dwelling with exposure problems. Firefighters worked in both B and D exposure to limit the extension. A 2nd alarm was struck bringing Engine 37 (Rescue), 30 (Penbrook), Trucks 12 (Lower Allen), 32 (Progress), and Air 13 (West Shore) to the scene. Companies made a great stop knocking down the fire within 15 minutes and preventing the whole block from being affected. Several people were left homeless in the fire believed to have started in the kitchen.